Eggs make a valuable contribution to a healthy, balanced diet. They are an excellent source of high quality protein. TV Pe Bhi Dikhaye Ke Roz Khaao Anda!!! I always use eggs for cooking, when I do not have much time, or when I am tired after a long day and don’t want to spend hours in the kitchen. They are so versatile and can be used in cooking in many ways. 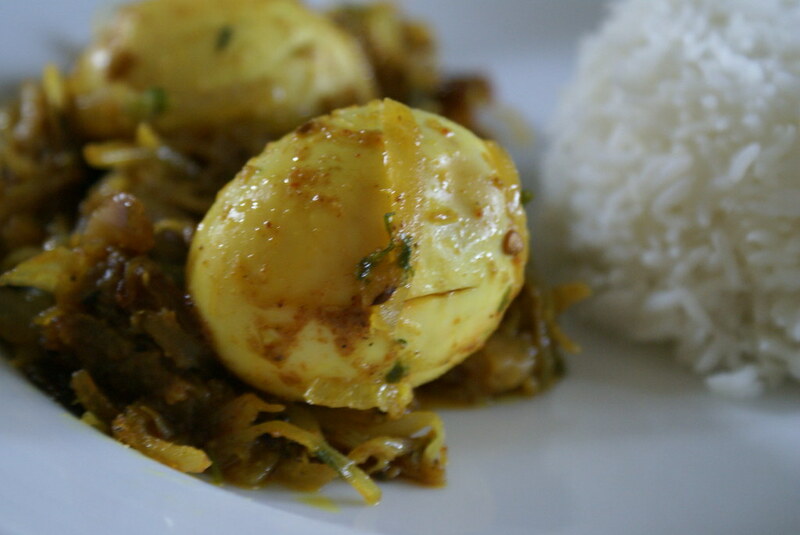 The egg curry below is one of the fastest and quickest one, if you have hardboiled eggs ready in the fridge. When buying eggs, open the carton to be sure none of the eggs are cracked; discard any that are, they may have bacteria that might contaminate the egg. Be sure to store the eggs in the original egg carton in the refrigerator. Don’t take them out and put them in the door. Every time the refrigerator door is opened it exposes the egg to the room temperature. To tell if an egg is hard-cooked or raw, place the egg on its side and spin it evenly on a level surface; if it wobbles, it is raw. You cannot hard-cook eggs in a microwave (they’ll explode), but if you find after peeling an egg that it is not quite done at the center, pierce it once or twice with a fork, set microwave to medium power and cook the egg for 10 to 20 seconds before checking if it is done. Slicing of onions and chopping green chilies. In the mean time, pressure cook rice. Heat oil, in a wide pan, add the ingredients for tadka(jeera and mustard seeds). Add onions and chilies and haldi. Add salt, red chili powder and garam masala. Add the eggs and fry for few more mins. Add chopped corriander, adjust salt and remove from heat. A perfect comforting food after a long tiring day!! This is my entry for the Summer express Cooking event being hosted by MalluGirl of Malabar Spices. I love anda in any form!!!! and u’r dish looks yummy!! I love the photos, anda look so delish, the recipe is quick and simple. have to have to try! I’ve never seen curry photographed so beautifully before and your recipe sounds wonderful. great picture cinnamon…your photos come out so well…and so tempting.. This is a great recipe….Beautiful pictures….YUM! Nice recipe. I make something very similar but add some tomatoes too. Hi Cinnamon! cool and yummy recipe for great event. Looks fabulous dear. I will try this. Thanks for sharing. that is nice, I add tomatoes. What a simple and tasty recipe…your pictures make it so tempting ! Cinnamon, you have inspired me, I am going to cook curried eggs with aloo next week. Yours has me drooling. Hey I remember that song of ande ka funda! Nice and easy recipe. And thanks for those useful tips. ThankYou everyone, for the Lovely comments!! Raaga, DO try it let me know, how u liked it! Truffle and Valli, Thank You! Laavanya, The fried onions make it even more delicious! Tbc, Sharmi, ya tomatoes will add even more taste and flavor! Sri, Bhags, Tee, Thank You Girls! Sunita, ya the song is very funny!! Cynthia, waiting for ur curried eggs dear! Innovative title. Loved the dish. hey…guess what today I made anda curry for lunch…very traditional recipe in Andhra and I love the addition on too much of onions…great pics! me and my roomy make it all the time.. in fact, its our staple food over weekdays..
but though i dont like eggs anymore – i think your photos look really cook. 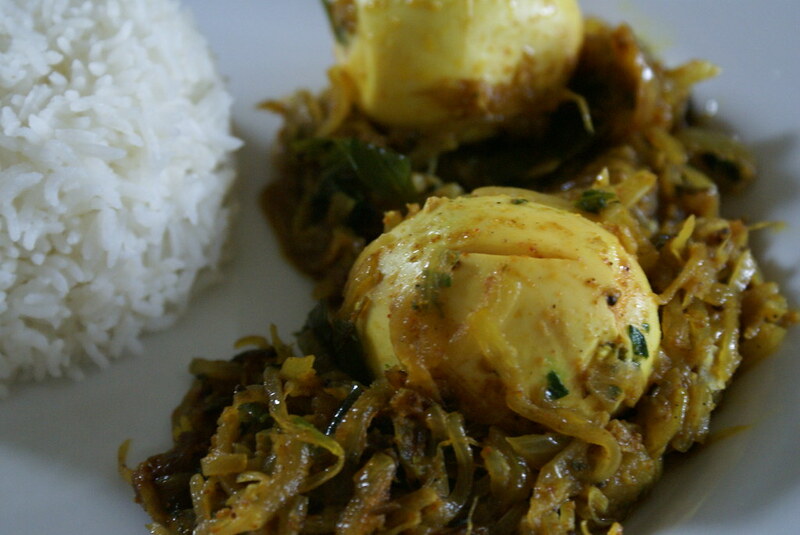 i usually dont find egg curry good to look at – but yours looks wonderful. Delicious looking Ande ka funda. I am not egg lover but i really liked this one.